The International Union for Conservation of Nature (IUCN), in partnership with the Ugandan Ministry of Water and Environment, United Nations Development Programme (UNDP), and the United Nations Environment Programme (UNEP), as well as local governments and civil society organizations, have been working to address many of the climate-related issues in the Sanzara community by employing Forest Landscape Restoration (FLR) with an integrated Ecosystem-Based Adaptation (EBA) approach to maximize community climate resilience. 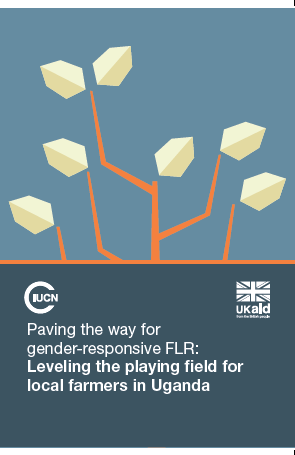 FLR is the process of regaining ecological functionality and enhancing human well-being across deforested or degraded forest landscapes. Effective FLR involves forests as it incorporates the number and health of trees in a given area, as well as landscapes, because it can include entire watersheds and jurisdictions where land uses interact. An EBA approach provides a viable option for sustainable and efficient adaptation to climate change by utilizing local biodiversity and ecosystem services to help communities adapt to the negative effects of climate change and includes sustainable management, as well as conservation and restoration of ecosystems, as part of an overall strategy that takes into account social, economic and cultural co-benefits.